I woke up this morning and took to my normal routine. I checked Facebook as usual, and saw a post about the Migos donating money to an Atlanta high school. Initially, I thought that was admirable gesture. However, when I looked closer, I noticed the amount of the check. Keep this in mind, the Migos constantly rap about money, standing on couches in VIP, and Versace. 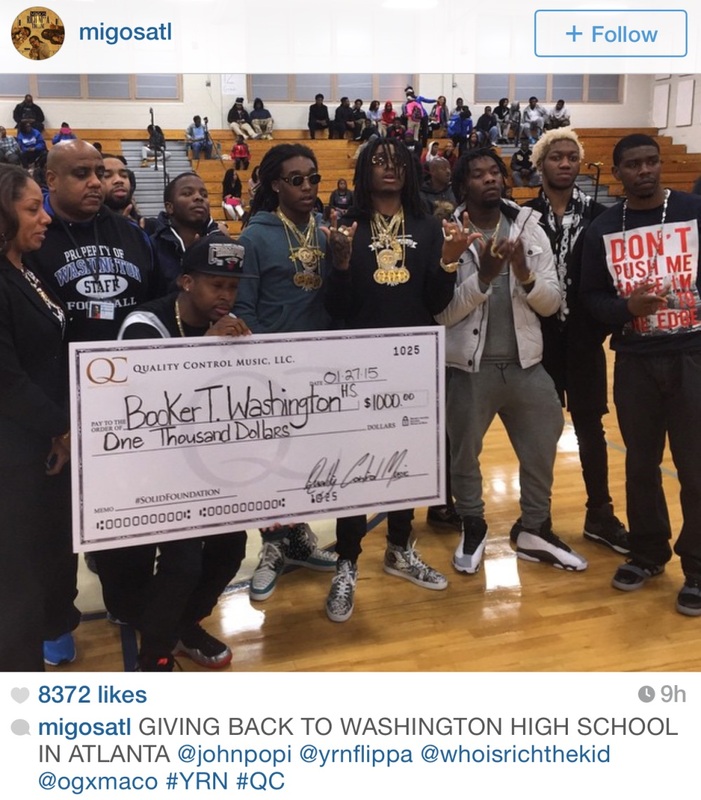 The Migos donated a whopping $1000 to the high school. Yes, you read that correctly. As my boyfriend pointed out, there are three members in the rap group. So, each member donated $333.33 to this school. Each member in the group picture wore multiple necklaces, and fly kicks. Remember the first thing I told you to keep in mind? How is it that this ‘successful’ rap group could manage to come up with only $1000 to donate to an entire school? And to make matters worse, they made a big spectacle about the donation. Don’t get me wrong, the gesture was very nice. However, they have the power to make a big difference in their community even if their music is trash. And if they truly believe in a #solidfoundation, as it was written on the check, why not make sure that your donation will provide that. Posted on Wed.Jan.28.2015, in Entertainment and tagged #FightNight, #RapMusic, #solidfoundation, #Versace, atlanta, Atlanta high school, AtlantaBlogger, Migos, Rappers. Bookmark the permalink. 1 Comment. Maybe they owed the school that money and for publicity…..